“Mr. 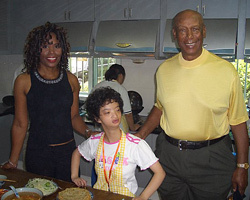 Cub” Ernie Banks and his wife, 500 Home Run Club, LLC President Liz Banks, were among the celebrities and dignitaries who where invited to represent the United States as part of the Presidential delegation that attended the recent Special Olympic opening ceremonies on October 5th, 2007, in Shanghai China. Mr. and Mrs. Banks were honored and thrilled to be special guests among more than 80,000 spectators and 500 million television viewers worldwide to experience a star-studded Special Olympics 2007 event at Shanghai Oriental Arts Center to honor extraordinary individuals who have made "special" contributions to raise awareness of the understanding and acceptance of people with intellectual disabilities. “The 2007 Special Olympics World Summer Games was a spectacular sports event and a truly moving experience where athletes and spectators joined together in an atmosphere of inclusion and respect for all,” said Liz Banks. “The great thing about the Special Olympics is that everyone is a winner.” supporting Special Olympics athletes as they compete and celebrate the spirit of sportsmanship. Editor’s Note: Both Ernie and Liz Banks have demonstrated a life-long commitment to helping children achieve their dreams through their “Live Above And Beyond Foundation” which provides educational scholarships, and promotes social welfare through programs that lessen neighborhood tensions, eliminate prejudice and discrimination among various age groups and races, and improve and develop the capabilities of children who are underprivileged and reside in disadvantaged neighborhoods. Other special guests included: Eunice Kennedy Shriver, Timothy Shriver, Maria Shriver, Governor Arnold Schwarzenegger, Actor Colin Farrell, NBA Star Yao Ming, Actor Jackie Chan, Actress/Singer Vanessa Williams, Music Legend Quincy Jones, Actress Zhang Ziyi, and Olympic Gold Medalist Liu Xiang, guitarist Keb’ Mo’, Bianca Jagger, and Donna deVerona. 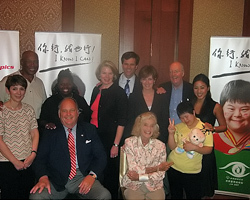 In addition, the event spotlighting the following individuals for dedication to the Special Olympics and educating the world about the accomplishments of individuals with intellectual disabilities: Nelson Mandela, Deng Pufang, California Governor Arnold Schwarzenegger, Nadia Comanici, Yao Ming, and Special Olympics athlete Stacey Johnston.